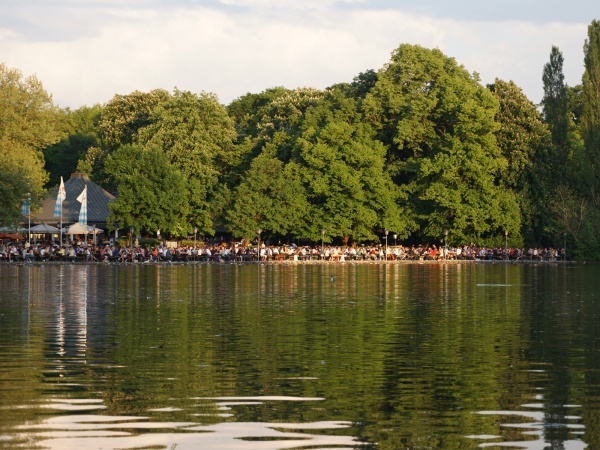 The Seehaus beer garden is located directly at the Kleinhesseloher See in Munich's green oasis Englischer Garten in the heart of the city. Englischer Garten is a huge park with meadows, forests and streams. The Kleinhesseloher See is an artificial lake, created in 1803. Seehaus is a beer garden with a very mixed crowd where young people show of the latest fashion, sportsmen relax after their workout in the park, older generations take a break from their walks and tourists experience the beer garden culture of Munich. The beer garden has about 2,500 seats on regular beer benches in the self-serviced area and on the terrace, with the best tables directly at the waterfront. The food stalls offer traditional beer garden meals such as Obatzda, Schweinshax'n (roasted pork knuckle), spareribs, meatballs and Auszogne. The beer served is Paulaner and a Maß Hell (lager) costs €8.40 (May 2018), which makes Seehaus one of the most expensive beer gardens in Munich! During the summer months Seehaus is open daily from 11am to 1am. Depending on the weather, Seehaus is also open out of season.